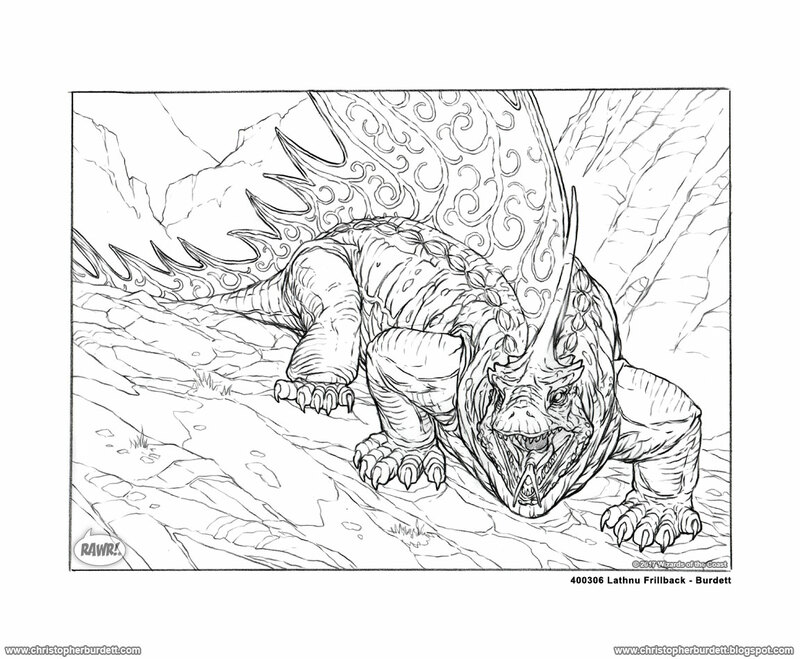 Magic the Gathering Art Updated and ON SALE! 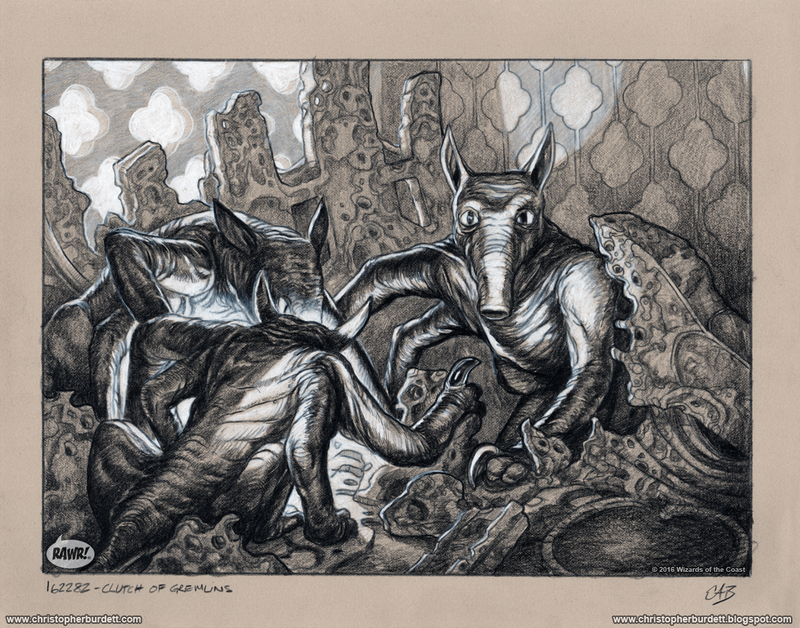 I have updated the available Magic the Gathering original drawings over on my store. A couple of pieces were missing. 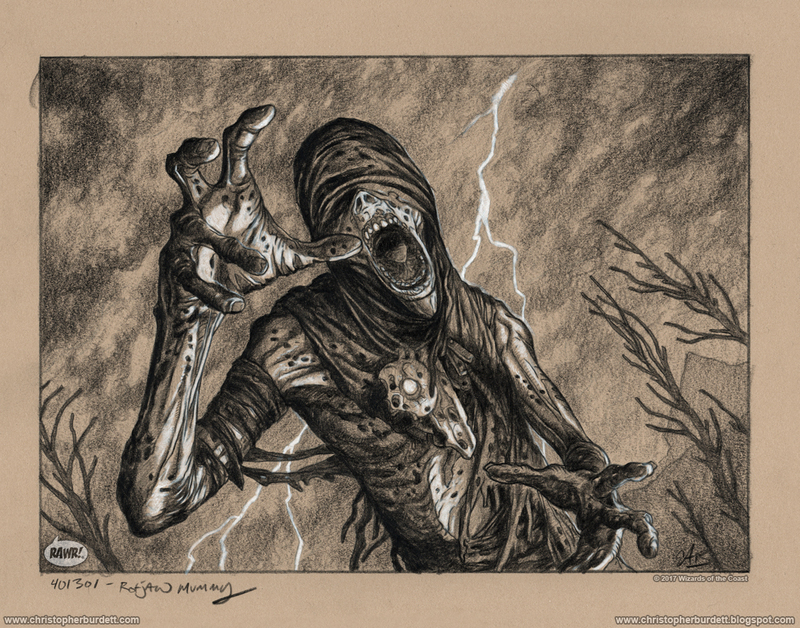 In celebration of getting everything updated, I will be offering a 20% discount on all of my original Magic the Gathering drawings until April 27th. Use code MagicMonsters at checkout to get the discount. Head over to my store to take advantage of this limited time offer! 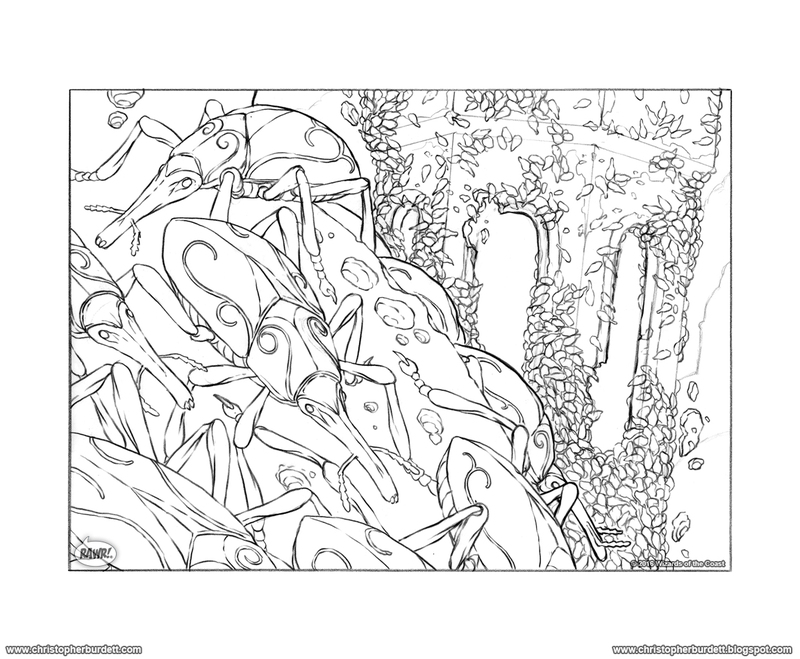 Here are all of the drawings currently available with links to each drawing on the store. 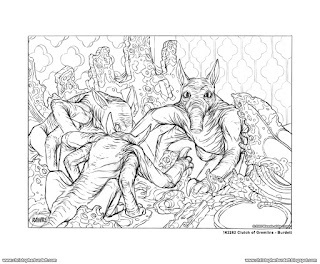 Again, use discount code MagicMonsters at checkout to get the discount on my store on all Magic the Gathering original drawings. 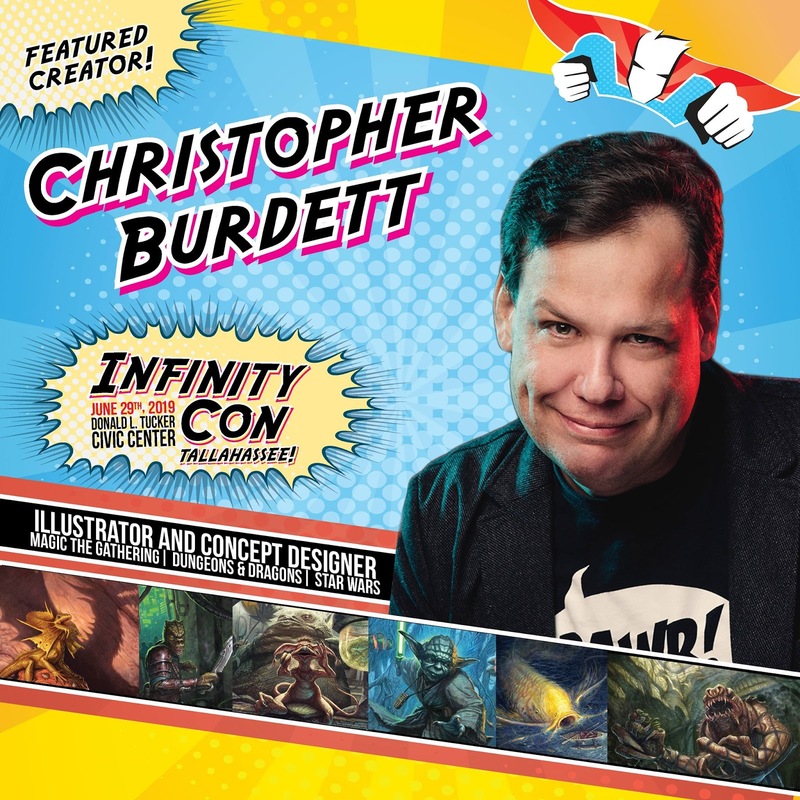 I am happy to announce that I will be a featured creator at Infinity Con this coming June 29th for a one-day convention in Tallahassee, FL. This is the first time the event will be taking place in Tallahassee, and it should be a lot of fun. I hope to see you out there if you are in the Tallahassee area. 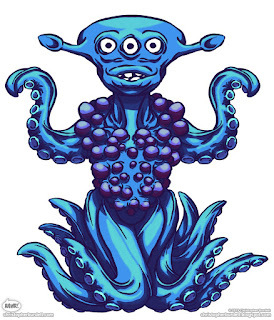 I will have all my monsters with me and most likely will be taking part in a panel. I will share more details as they come available. 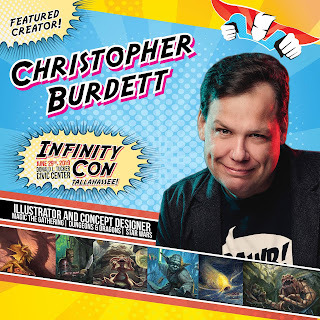 Come see me and many others at Infinity Con this coming June 29th! 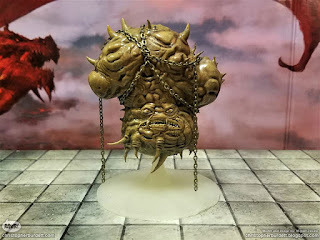 I recently came across a cool custom miniature by Miguel Zavala. Miguel has created a great number of custom 3D Dungeons & Dragons miniature models that are available for printing. This time around he made a Sibriex based on my illustration in Mordenkainen's Tome of Foes that came out last year. 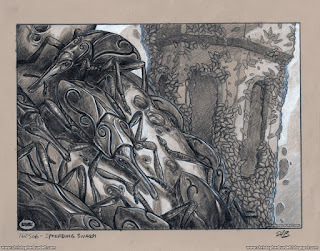 I think he did a terrific job on it and he gave me permission to share it here on the blog. Pretty cool if I do say so myself. If you have a chance, you should check out more of Miguel's work. 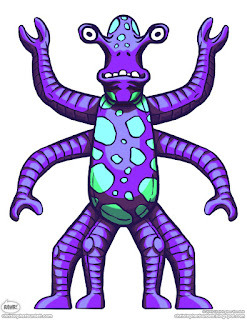 Here is my painting of the Sibriex so you can see how faithful he was to the original. Today on the blog I wanted to point out some current Kickstarter projects by friends of mine that I think you all might be interested in. Both feature amazing comic art by awesome people, and if you have not already checked them out, you should do so NOW! 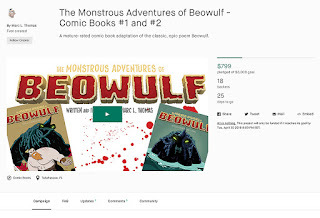 First up is Marc Thomas's The Monstrous Adventures of Beowulf - Comic Books #1 and #2 Kickstarter! 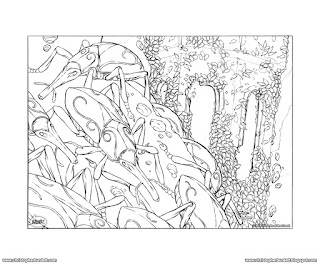 Marc is a great illustrator and visual storyteller and this is a project near and dear to him. Books one and two, which are the books in this Kickstarter, are COMPLETELY finished. He is raising printing costs to get the books made. Book 3 is nearly complete and will be available later. This looks to be a super good limited series, and I can't wait to see it! Next, we have Hoyt Silva's (and team) Last Stop Kickstarter. I have had the great opportunity to watch Hoyt develop and mature as an artist. I first met him when he worked at a local comic shop with dreams of making comics. He made his dreams a reality, and he has been creating beautiful art in the comic industry for some years now. I always enjoy seeing his work, and with everyone's help, his next project will be a reality. 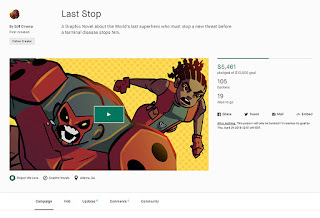 Along with Hoyt, writer and co-creator Trey Walker, and letter Micah Myers are working on "Last Stop is an action-packed, over the top, extra large graphic novel about a superhero out of time—in more ways than one." I am really exited about this one and really want to see it get made. As with all Kickstarter projects they need the help of people just like you to become a reality. I hope you will take the time to head over and check these both out, and hopefully support them! 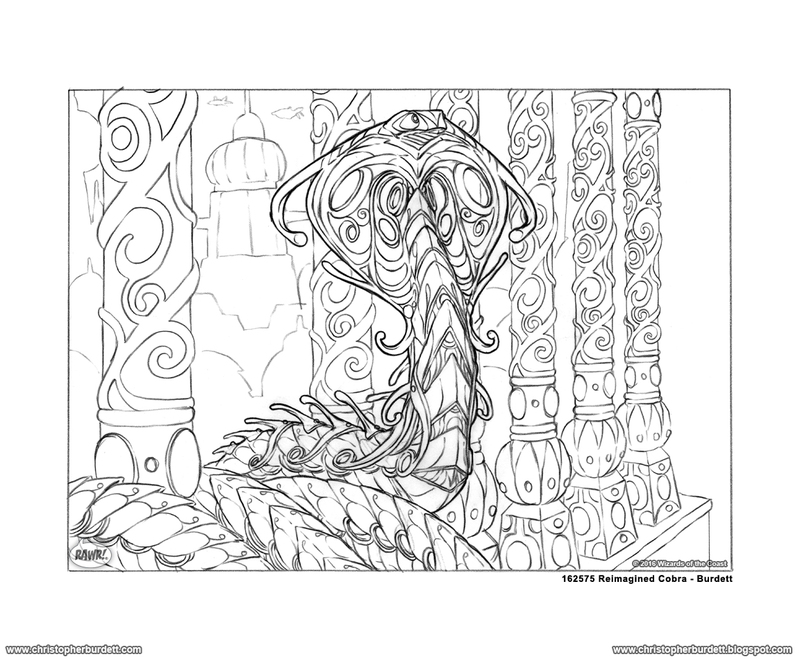 Today I have for you the steps and process that went into creating the Choker illustration for Mordenkainen's Tome of Foes that came out last year. 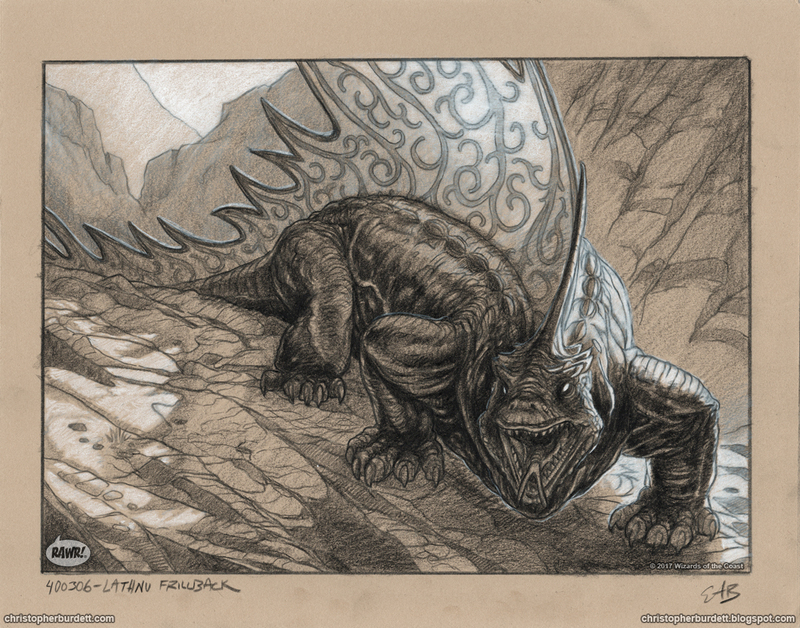 This was the first of five paintings that I created for the book and one of my favorites. It is a classic monster and it was an excellent opportunity to give my personal spin on the Choker. The production flow for this piece was unchanged from all of my digital work from the past years so I might be a brief on the details. If you feel like you would like a more in-depth explanation of my process, I offer the following links: Break down 1, Break down 2, and Break down 3. To start things off, here is the final painting for the Choker. As with all my illustrations, I begin everything with a photo reference shoot/collection followed by the creation of thumbnails. For a humanoid monster such as the Choker, I had my wife photograph me making the best Choker impressions that I could. I used these photos to guide the poses and compositions of the thumbnails. These are the three thumbnails that I submitted for the Choker. 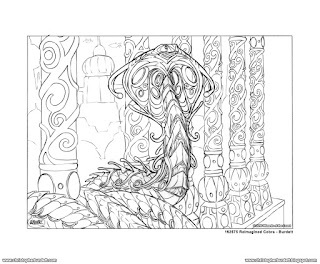 Option B was selected from the thumbnails which meant it was time to work up a finished drawing. Here is the final drawing that was submitted. There were no edits or changes after submission. With an approved drawing it was time to get started on the painting. These isolated figures are a straight forward process. I created a masked clipping layer using the silhouette and never worry about the edges. When I shot my photo reference, I take into account lighting, so that is already worked out when it is time to paint. For a lot of these monsters, I like an up lighting situation, I feel it adds a bit of drama and makes the monster more menacing. Here is the painting coming together in twelve steps. To make the process of the painting a little more clear, here it is coming together in an animated gif. Finally, here again, is the final painting of the Choker. I occasionally will talk about the day job here on the blog, but most of what I do at there is not relevant to the blog. On 2017 however, I worked on a project that lines up perfectly with my interests and activities outside of work. 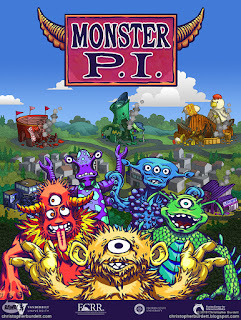 I was part of a team involved with a project I got to name called Monster P.I. 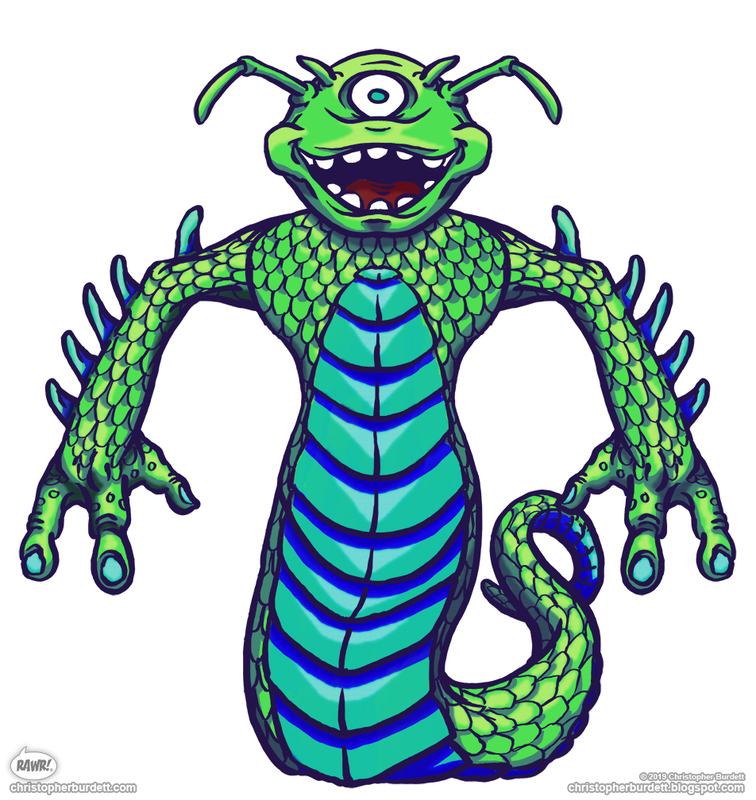 As the name implies it involved monsters, which I was was in charge of designing and illustrating. 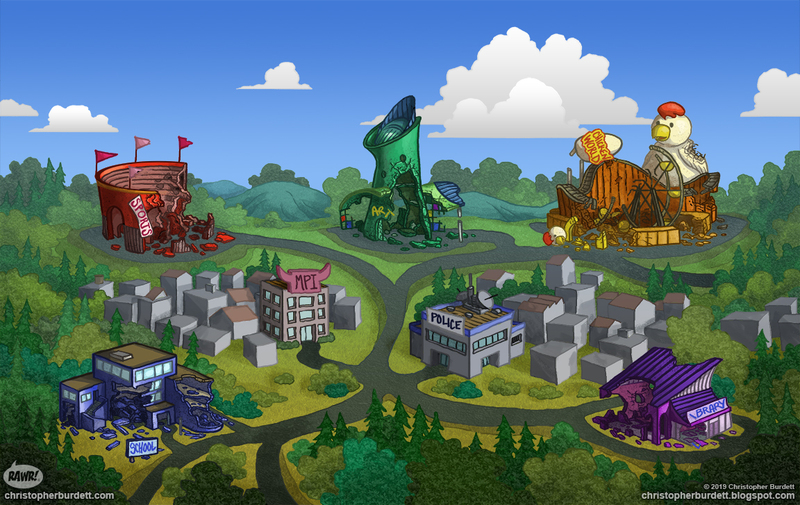 As the project progressed, I also created a hub world illustration that was used as a map as well as a handful of other graphics and elements. This project is a "word detective game assessment for 5th-8th grade students". 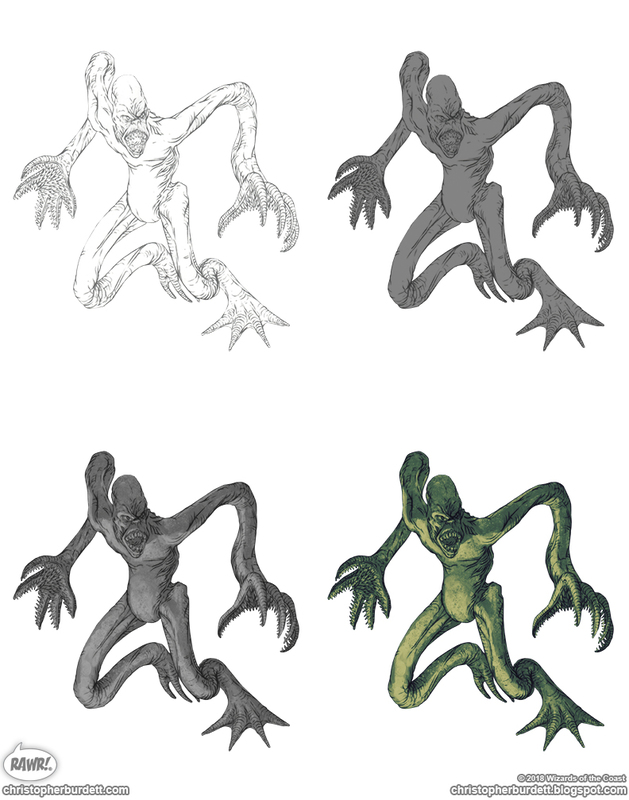 As the student progresses through the assessment, they will be given clues to the monster they are pursuing. At the end of the assessment, they will be given the opportunity to pick their monster out of a lineup. The monsters are created in such a way they all of their parts are entirely interchangeable, so while there is a master version of each, they can be recombined into thousands of different and unique variations. Also at the end of the assessment, the student has the opportunity to create their own monster with all the pieces available. Here is a look at some of the work I did on this project. Monster P.I. 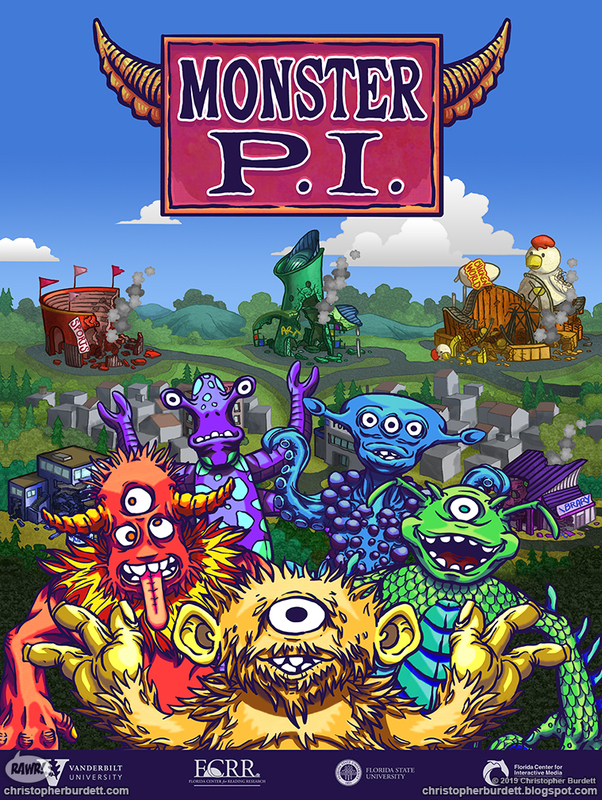 poster, I created the logo, the background and all of the monsters. 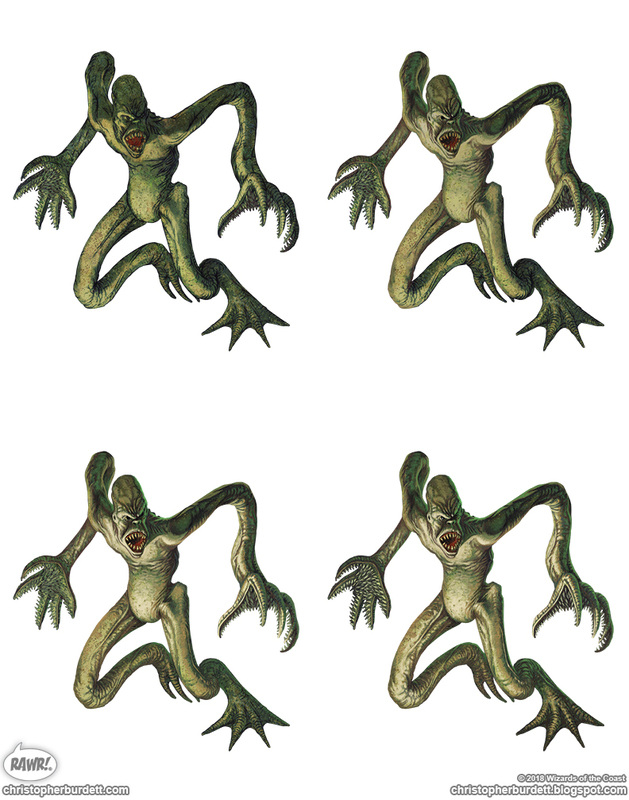 Here is the lineup of all the monsters in their original forms. I also named all the monsters and created a back story for each one. This is Dundur. 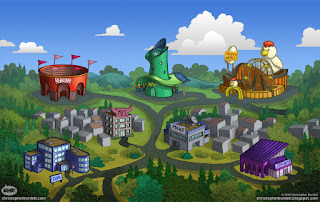 Dundur likes to go to the amusement park and ride all the rides and play all the games. Unfortunately, Dundur is too big and heavy to enjoy human rides and games without breaking them. Not to mention Dundur eats all of the cotton candy. There is not much amusement left after Dundur has been around. This is Snerp. Snerp is a real connoisseur of art, and she enjoys spending long days in museums looking at all the beautiful paintings and sculptures. Unfortunately, Snerp’s tail has a mind of its own and breaks everything around as it whips excitedly back and forth whenever Snerp is enjoying a piece of art. Not to mention Snerp sheds her scales constantly and they are too big to vacuum up. Every masterpiece becomes a masterpieces when Snerp shows up. This is Tromps. Tromps gets a real kick out of being physically active and playing monster sports. Unfortunately, the monster sports that Tromps likes to play involves smashing and breaking everything that he can get his hands on. Not to mention Tromps likes to use all the baseball bats to pick his teeth. You are going to strike out if Tromps comes to play. This is Wobbly. 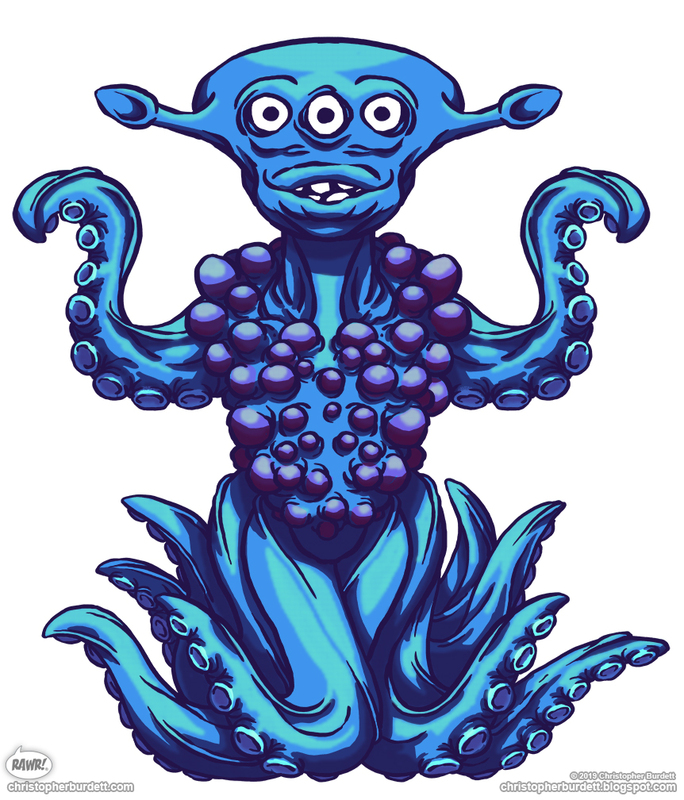 Wobbly is a studious monster and enjoys attending classes at any school she can find. Unfortunately, Wobbly’s tentacles get stuck to everything she touches, leaving every school she visits a complete mess. Not to mentioned Wobbly leaves a thick layer of slime on every surface. You don't have to be an A student to know you don’t want to be in the same class as Wobbly. This is Zirrple. Zirrple enjoys checking out the library to look at all the books and read exciting stories about goats and steam engines. 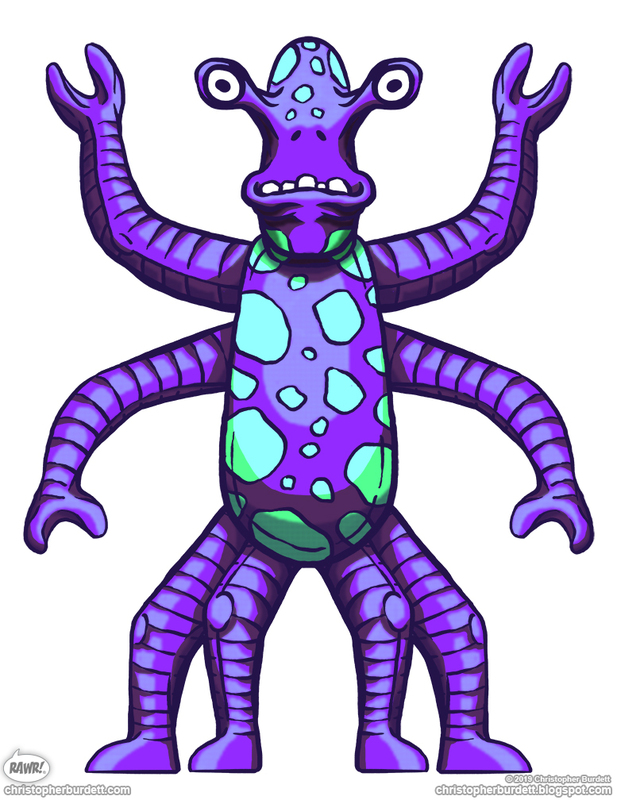 Unfortunately, Zirrple can’t keep track of what his many hands and feet are doing all the time, and many books are stomped on and ripped apart. Not to mention Zirrple’s fingers are not good for turning pages, resulting in many damaged books. You don't need to be a scholar to know that the library is better off without a visit from Zirrple. 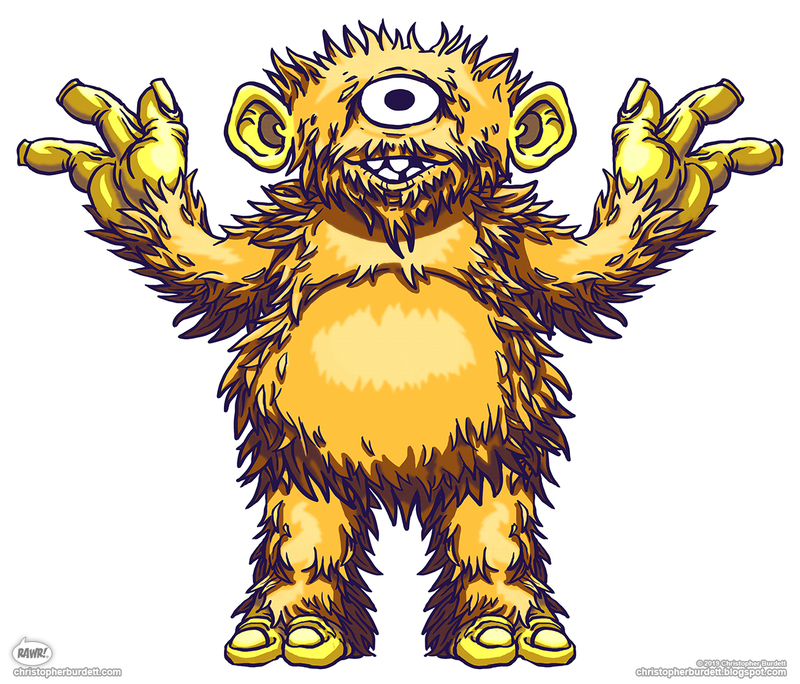 As mentioned, all of their parts and colors are entirely interchangeable making for many interesting, silly, and fun monsters. 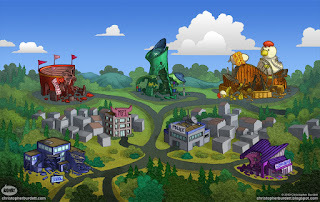 The hub world or map is used to navigate through the assessment. 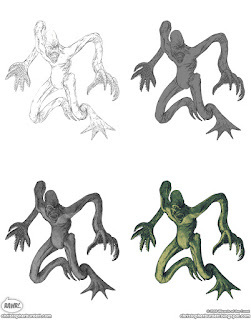 There are five locations, each tied to an original version monster. When the student begins the assessment, everything is damaged, and as they proceed through it, the locations are repaired. This was an unexpected but fun aspect of the project. 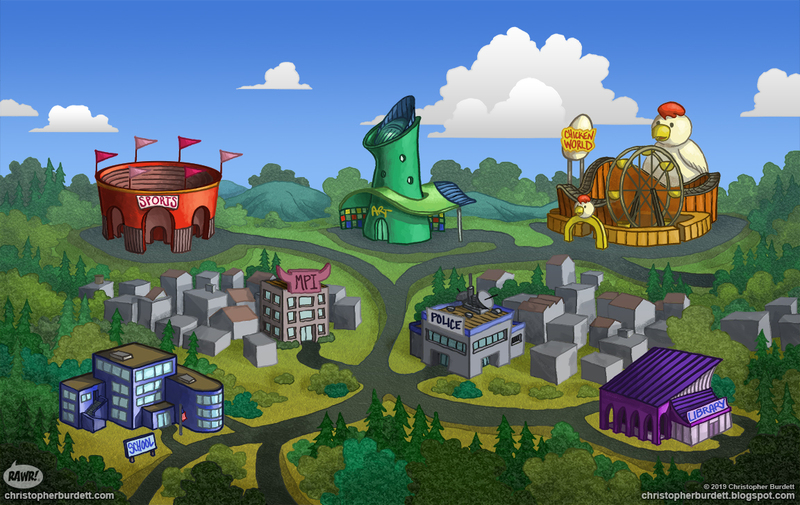 There are five minigames associated with each location that the student visits. After the assessment, the student can play the game, and once the assessment is completed the student can revisit any of the games. They are all fast-paced timed games. I was part of the design team for the games and created little animated gifs to help explain what is involved with each game. This was another unexpected but fun part of the project. Here is a video that the center has used to advertise the game and our ability to create such projects. The plan is to do more projects like this, which is good since we are already working on a similar project. It is funny how certain pieces, no matter how old they are, still seem to reappear time and again. The Beast concept illustration I did ten years ago is just one of those pieces. Originally created as a portfolio piece it has grabbed people's attention repeatedly over the years. 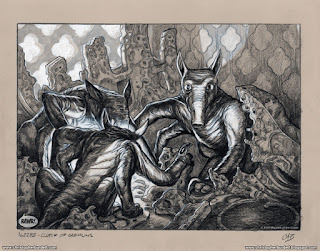 Not sure what it is about this piece, but even today it is still back on the blog. 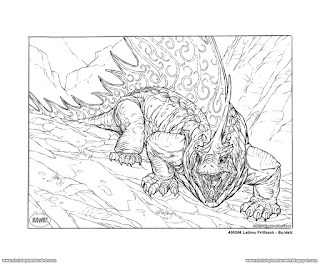 I was contacted by Antony Rahul earlier in the week to let me know he had used my Beast concept as part of a school assignment. Antony studies animation and game design in Wiztoonz India and his assignment called for finding a preexisting design and modeling it. Here is how Antony's take on the Beast concept turned out. Looking good! Always fun to see my illustrations turned into a 3D model, miniature, etc. I think Antony did a great job with it and I hope him all the best with his studies and his future. 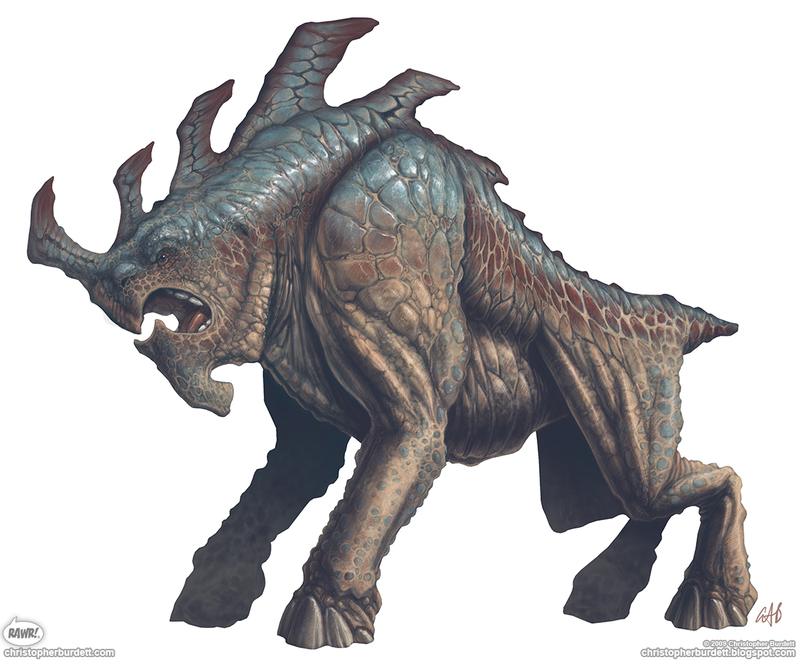 Here is my original Beast concept so you can get a look at what a great job Antony did. 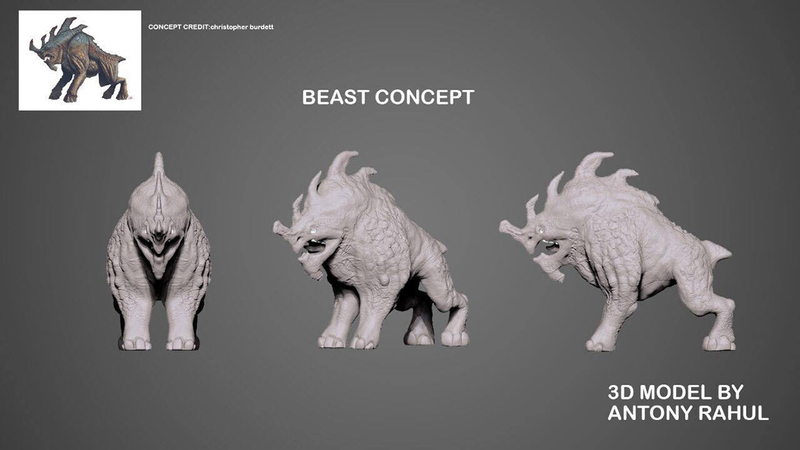 The funny thing is, this is not even the first time the Beast concept has been used as part of a class assignment. Back in 2013, Gustavo Labrador García created his one 3D model. Like I said, it is funny how certain pieces keep coming back into the spotlight.